Many people have difficulty leash training a puppy. We’ve all seen how it looks when a dog has not learned to walk appropriately on a leash. The owner is pulled along, the dog is gasping for its last breath and both are pulling with every ounce of strength in their bodies. Unfortunately most of us have not just seen it—we’ve been there! 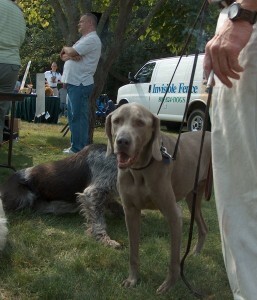 Your Weimaraner needs to be leash trained, if you want to take her to public places and events. Dogs are pack animals and they like to think that you are both in the same pack. As the handler, you need to assume the position of “pack leader”, and your dog becomes a follower. You will have to teach your dog that you are calling the shots. This is true whether you are working with a brand new Weimaraner puppy or an older dog who has not yet learned how walking on a leash (should) work! Of course you will want to get your new puppy used to his leash, as soon as you can. Puppies like to explore new places and things, so your pup will be interested in sniffing, mouthing and exploring his leash. You should let him do this. When your Weimaraner pup is comfortable with his leash, it’s time to start his leash training. This video shows Doggie Dan with a client, showing the dog owner how to get her dog to walk nicely on a leash. This demo will show you that the training does not have to take a long time. Dan has such great tips and I love his approach! You can access his online teaching videos for just $1 here. If puppy leash training is done correctly, you will have complete control of your dog, and this will be true—whether or not he’s on a leash. In the beginning, choose a quiet location, free from distractions, including other people and dogs, for you to practice leash training. As your dog gets better walking on her leash, you should practice in different locations and settings, eventually getting to the point where she will obey your commands in a crowded public place. Be patient with your dog. Never yell at your dog or strike her, during a lesson. Leash training a puppy should be fun for both of you. Keep initial sessions short. Puppies have short attention spans, just like small children. If your pup is especially energetic, leash lessons will be more productive if you involve your dog is some active play time before dog leash training. If she is a bit tired, she will be more cooperative during lesson time. Never pull on the leash to get your puppy to come. This will just start a tug of war, as your puppy’s reaction will be to pull back. This is exactly what you DON’T want to happen! Reward your dog often, with small, healthy dog training treats and with lots of praise. Leash training a puppy is not a control issue. It’s really a safety issue. When you have your dog under control, your dog will be safe—no matter where you are and what is happening. So it’s definitely worth the investment of your time and energy, to teach your puppy to obey your commands! 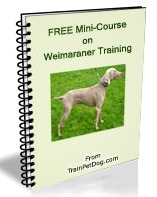 You can learn more about Weimaraner training and get access to the Doggie Dan training videos and forum for just $1 here.